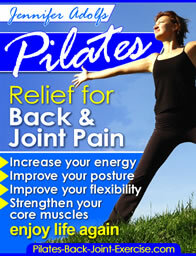 You can find some great Pilates exercise equipment online. This equipment is great for adding extra challenge and variety to your workout. This challenge comes from the extra tension you’ll find on a reformer or resista- band, and from the instability of an exercise ball. 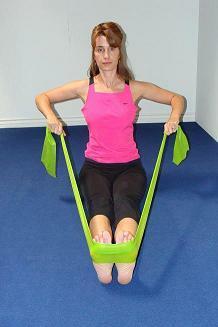 There are many different kinds of Pilates home equipment. Some of the equipment and accessories are small, inexpensive, and travel well. 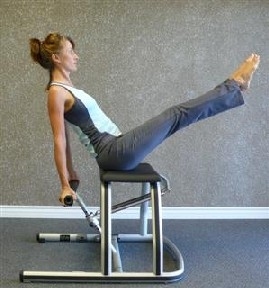 Other home Pilates Machines are larger but do take down easily, and are much more expensive. Check out the following articles to learn about each piece and how to use it. There are many benefits to using the resista-band including it being the least expensive, easiest to travel, and you get a great resistance workout! The stretch band also imitates much of the work you can do on the reformer using the spring tension for a fraction of the price at only $5-$10. Pilates Exercise Ball: Find the Pilates Core Ball Challenge DVD here. The many benefits of an exercise ball include its versatility of use, instability to better activate the core muscles, and it's just plain fun! You can find exercise balls most anywhere for between $10 and $30. This piece of Pilates exercise equipment is just "magic", fun and easy to use with loads of resistance for the upper and lower body. Great way to target the thighs and triceps. The magic circle will cost between $15 and $35. Here are some articles that will explain these home Pilates machines, how to use them, and where to find them. These machines can cost from $250 to over $1,000 for the studio versions. Pilates Exercise Machine: Find out all about the different machines that Joseph Pilates very creatively designed with the health of your body in mind. Everything from a chair to a cadillac! Find a great chair workout as shown below by going here. One of my favorites, a very versatile spring loaded piece of Stamina Pilates exercsise equipment that works the entire body! Find out how you can exercise lying down, sitting, and kneeling on this Pilates machine. Check out some of my favorite Pilates Equipment Workouts Here. Find out the many benefits of owning an inversion table, and why doing Pilates along with using an inversion table is a winning combination to end your back pain. Leave Pilates Exercise Equipment Online and check out more free articles and information about how Pilates can benefit you.